So your startup or small business is ready to take off and you need to hire salespeople. As the owner, there are too many other projects for you to tackle and you need someone dedicated to finding and closing new business. Most owners think they need to hire a rock star salesperson with a track record of closing business in their industry. That rock star sales person usually demands a six figure base and a total comp package way north of six figures. In most instances, this type of hire is going to be a failure. The owner assumes that the rock star salesperson is going to transform their business and bring them 10X what they are paying for their salary. Owners forget that finding opportunities in a small business environment is usually as tough as closing the deal. $30-35k/year base – A true hunter that is dedicated to generating new leads. They get bonuses based on number of leads generated per month and a small percentage of closed deals. Have this person focus on outbound email marketing and generating lists of prospective clients. $45-55k/year base – Find someone 2-3 years out of college with sales experience that wants to make a lot of money. Put together a compensation package that gives them the opportunity to make $100k+ when closing business. $15-20k/year – Find someone locally who knows how to setup and optimize online advertising campaigns (if paid advertising makes sense for your products). This individual would manage the campaigns and do things such as setup and monitor dedicated landing pages for your paid advertising. This person or agency will help setup an infrastructure to drive new leads for the company, without hiring a full-time online marketing specialist. With a very similar budget you are getting full-time dedicated lead generation, online marketing expertise, and someone to close business for you. Get a solid lead funnel in place way before hiring a rock star salesperson. When there are no opportunities to close, a high paid salesperson is probably not the way to go. 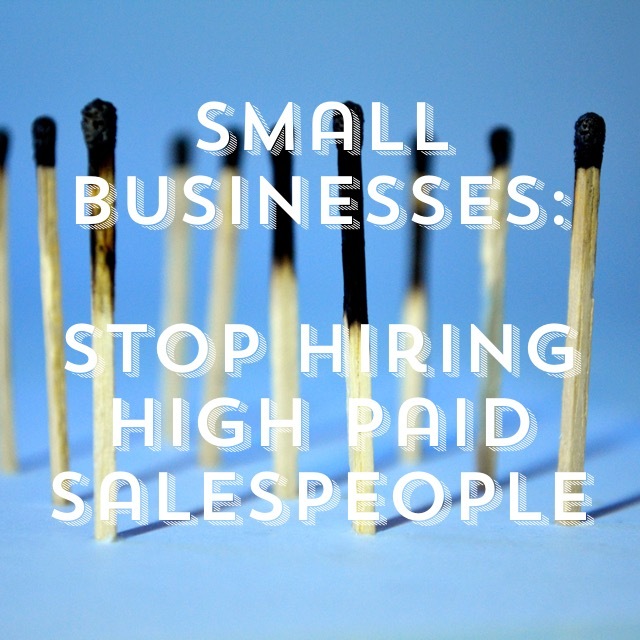 This article was syndicated from Business 2 Community: Small Businesses: Stop Hiring High Paid Sales People!